In normal service MTR trains are driven back and forth along the same line each day – only the driver changes cabs at the end of the line, with the carriages themselves always facing the same way. 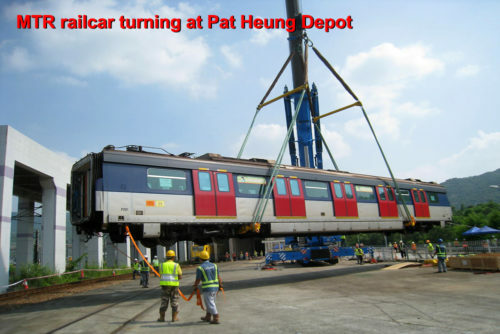 However the current remarshalling of the MTR SP1900/1950 EMU trains from a mix of 12, 7 and 4-car long trains into a uniform fleet of 8-car trains has seen the need to reverse some carriages. With no reversing loops, turntables or triangle junctions on the MTR system, this meant a heavy lift crane needed to be called in to pick up each carriage, turn it around, then place it back on the rails. In the SP1900/1950 train remarshalling program, more than 120 cars need to be reversed. To lift and move the weight of 37 to 51 tons is not a simple thing! In order to secure the body so the car can be lifted, the engineering staff attach a yellow lifting frame at the ends of the carriage near the bogie, and then the crane. When the carriage is lifted, the ground personnel will pull the rope in advance of the four corners of the carriage, to assist the crane in the 180° reversal. Workers also need to ensure that eight wheels of the carriage have been placed back onto on the track. Here we see Ma On Shan line driving carriage D514 getting turned by crane on 11 February 2017. Followed by motor cars P509 and M509. While this video from 13 April 2016 shows brand new intermediate carriages being shunted around the depot. 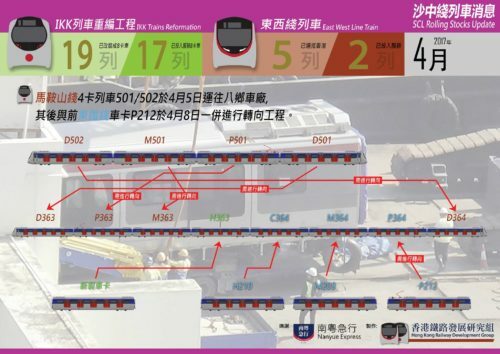 This diagram created by the Hong Kong Railway Development Group shows how a 4-car long Ma On Shan line train is remarshalled into an 8-car long train for the future East-West Corridor. “需進行轉向” translates to “needs to be turned”. I can see a whole lot of shuffling going on, and five out of the eight carriages needing to be turned – but I can’t see the logic in reversing both driving carriages to create a train that looks the same as before! This entry was posted in Transport and tagged Hong Kong, KCR, Kowloon Canton Railway, Mass Transit Railway, MTR, rail operations, railway, trains. Bookmark the permalink.